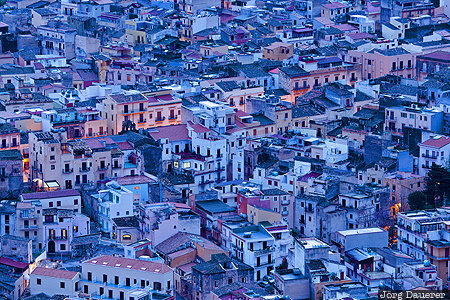 The patterns of the maze of houses of Castellammare Del Golfo at the blue hour after sunset. Castellammare Del Golfo is in the province of Trapani in the north of Sicily, Italy. This photo was taken in the evening of a rainy day in April of 2017. This photo is part of the exhibition Urban Patterns (June 2017). This photo was taken with a digital camera.